Massages are a powerful and reliable way to improve your mental and physical health. Although they were once seen as a luxury that was exclusive to spas and high-end establishments, nowadays, massage therapy is a pervasive, all-natural treatment that is offered in hospitals, businesses, clinics, and—yes—gyms and fitness facilities. At Willow Bend Fitness Club, we offer advanced sports massage therapy to our guests as a way of supporting our goal of helping the people of Plano, Texas, achieve optimal well being. In addition to certified massage therapists, we also offer our gym members access to a facility with state-of-the-art equipment, cryotherapy, and expert physical trainers. Contact us to learn more! 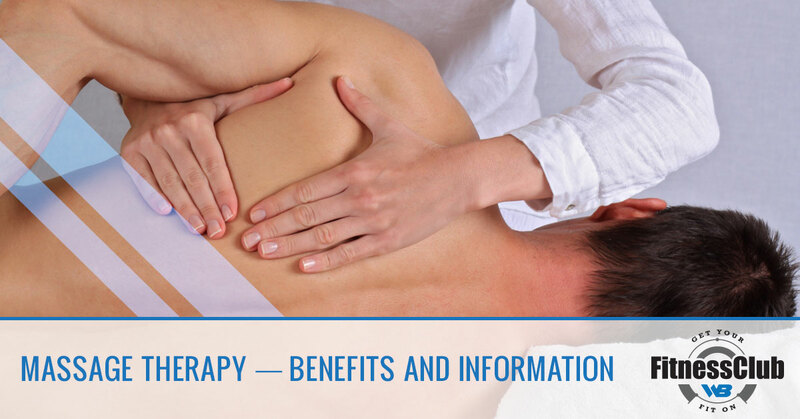 Read on to learn about massage therapy and some of its benefits. Swedish Massage – This type of massage is known for being relatively gentle. It uses long strokes, vibration, kneading, and tapping to relax your body. Deep-Tissue Massage – This form of massage is focused on using slower, forceful strokes to affect deeper layers of muscle and tissue. It’s a massage technique that is especially helpful in treating muscle damage. Sports Massage – Developed to treat those who strain and exert their muscles in sports and other activities, this is like a Swedish massage with more of a focus on performance. Trigger Point Massage – A technique that focuses on loosening up muscles that have tightened because of injury or overuse. Rolf Method of Structural Integration – Combining a full-body massage with client participation, this type of massage focuses on repairing connective tissues and adjusting posture. It is most effective when used to relieve aches that stem from chronic muscular pain. Learn more about this method here. Because of its demonstrated benefits and virtually nonexistent risks, massage therapy and muscle therapies are a great form of natural medicine. It is an effective way to treat pain, reduce stress, relieve muscle tension, and enhance your physical performance. If you have had a massage before, you likely remember the great feeling that followed. Not only does your body feel more limber and relaxed, but you also feel a clearness of mind. This can happen just after one session. However, after getting regular massages you can build on this feeling, creating a greater sense of physical and mental ease throughout each day. As Plano’s only upscale fitness facility, we take pride in offering our clients the resources and equipment they need to achieve their very best health. This includes a safe, fully-equipped facility, committed, experienced personal trainers, fitness programs, cryotherapy, IV bar, ultra SculptaDerm treatments, and various forms of massage therapy. If you want to learn more about our services or how you can become a member of Plano’s top fitness facility, contact us today!